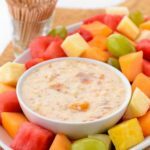 Apricot dip served is fresh fruit is a great appetizer or after school snack. It's made with Greek yogurt, apricot preserves, coconut, and walnuts. Stir together all ingredients and chill for at least 1 hour. Serve with fresh fruit.